I have got an opportunity to dive in the Philippines at the end of this month. I have never been there and am just starting my research. At this point, I have had recommendations for Anilao, Puerto Galera, Tubbataha, and Apo Reef. Have you been there ad done that or even better, are you there now? Any tips on where to go, how to get there, where to stay, what operators to dive with, etc. would be greatly appreciated. You can post comments on the diveseven.com article or on the facebook.com/diveseven page. If you search on google for ‘World’s Best Dives’ the top result is scubatravel.co.uk and their list of the “100 Best Dive Sites of the World”. A tiny island called Sipadan off the east coast of Malaysian Borneo garners 5 of the top 100 spots on the list. The coral island was formed over thousands of years on the top of an extinct volcano resulting in spectacular 600 meter walls rising out of the blue. Jacques Cousteau said, “I have seen other places like Sipadan, 45 years ago, but now, no more. Now, we have found again an untouched piece of art…”. This quote is used quite often in the marketing for Sipadan and it is a perfect introduction for what I want to tell you. My journey to Sipadan started with a flight from Kuala Lumpur to Tawau. Once again, Air Asia is your friend. Their flights out of KL are generally plentiful and inexpensive. Furthermore, their excess baggage charges are reasonable for divers IF you pay for your baggage when you book online. I was met at the airport by a transfer from the Scuba Junkies dive operation that took me to Semporna, a little over an hour away…. (after being briefly detained by border control for some unspecified problem with my arrival/departure card…). There are currently only 120 permits per day issued to dive at Sipadan. Many of the dive operations even require you to dive the surrounding islands one day for every day you are granted a Sipadan permit. In my case, I did not have a permit and Scuba Junkies was sold out. So, my only option at that point was to dive the other islands and hope something good happened on the cancellation list. 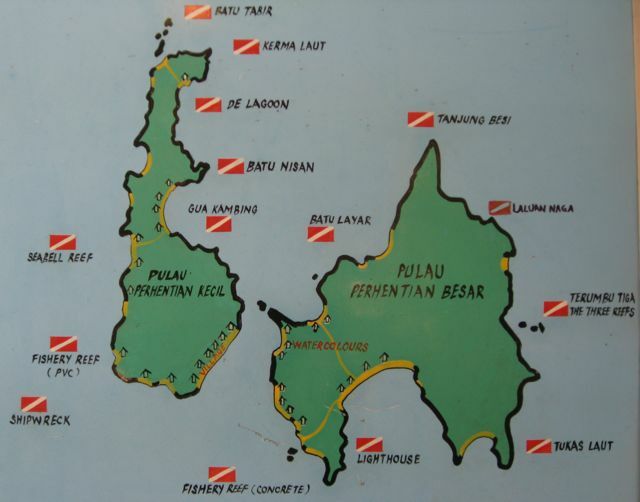 The islands that I dived at near Sipadan included Mantabuan, Sibuan, Kapalai, and Mabul all in the Celebes Sea. These islands excel in “macro” or “muck” diving. 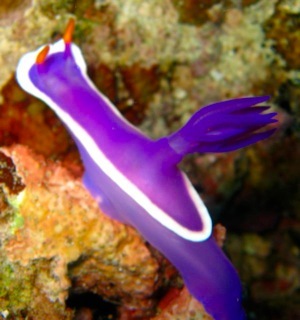 This means that you are looking for small things like Nudibranches, Shrimp, Crabs, Frog Fish, Pipefish, Seahorses, and more. I enjoyed diving these islands for several days but I was definitely in the mood to see something bigger and started getting more proactive trying to find a permit for Sipadan. Some divers that I met in the Perhentian Islands told me about a converted oil rig close to Mabul where you could stay and dive Sipadan. In fact, when I was staying on Mabul diving with Scuba Junkies, it was directly in front of the resort. 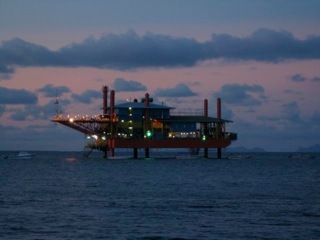 It turned out that Seaventures had a room on the rig available as well as two permits for Sipadan! I spent the next two days in air conditioned comfort diving at Sipadan. 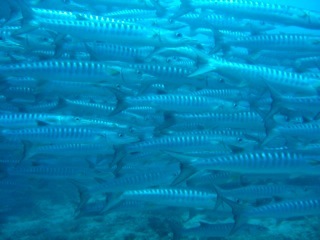 Barracuda Point is the most famous site at Sipadan (the #3 dive in the world according to the ScubaTravel list). It definitely did not disappoint. The schools of Bumphead Parrotfish, Barracuda, Trevally, and White Tip and Grey Reef Sharks are truly impressive. 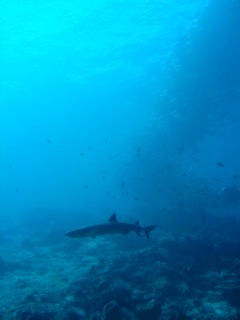 A shark cruising at Barracuda Point but check out that school of fish on the righthand side of the photo. Very nice. Barracuda Point was like a good movie that friends have told you about. I knew pretty much what to expect and it met my expectations. 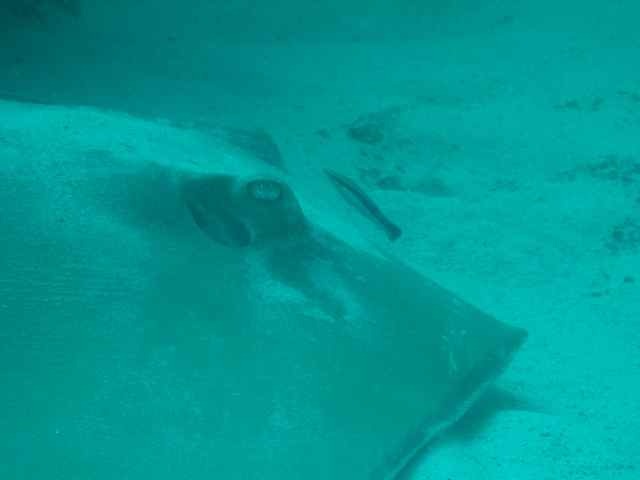 My absolute favorite dive on Sipadan was the one that surprised me at South Point. It’s not like South Point is any slouch of a dive site. 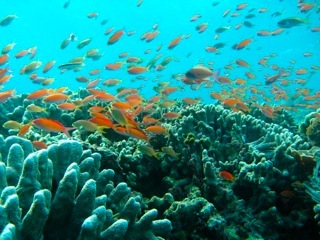 It’s the second highest rated at Sipadan and #23 in the world according to the ScubaTravel list. (Let me point out now that I’m not a big believer in ‘ratings’ for dive sites. My favorite dives have mostly been at sites that do not appear on any lists. However, it is convenient to have ~some~ relative idea of what we are dealing with). I had a couple things going for me the first afternoon I was at South Point. First, there was just one other diver on the boat for the afternoon trip. On the day that you have a Sipadan permit, Seaventures allows the permit holders to share the cost of the boat returning to Sipadan for two more dives. Only two of us were lucky enough to make that choice. Next, while we were on the island doing our surface interval the soldiers starting running around hectically. (There is a machine gun nest and small military force present to protect tourists after a terrorist incident in 2000). The first translation that we got was that “the president was coming”. This turned out to be untrue and it took me another day to find out that all the commotion was about a former governor of Sabah of royal descent. In fact, I found out during my research that he was responsible for encouraging and building up tourism around Sabah and Sipadan. This explained why he stopped to speak to me and the photographers seemed quite pleased for the photo opportunity with a tourist. Technically our permits expired at 5PM but because we had to wait for the entourage to leave the dock we essentially got an early evening dive on Sipadan by royal decree. The timing was perfect. The amount of life on the reef was tremendous. Sharks cruising both above and below us, turtles everywhere, trevally starting their evening hunt, more reef fish than I think I have ever seen, and beautiful healthy dense coral sitting on top of a wall where you could stare 600M into the abyss. I still remember exactly what I said when I surfaced, “Wow, wow, wow, that’s why I dive!”. I started this post with the quote from Jacques Cousteau that included a bit about “…but now, no more”. When I was diving in and around Sipadan I was continually reminded that we are in the middle of a relatively silent and unseen battle. When the dive guide asked me what I wanted to see, I said, as I always do, “sharks”. His answer, when we were at Mantabuan was sadly, “There used to be sharks here but now, no more”. He was not talking about the 1960′s or “45 years ago” as Cousteau was. He was talking about diving there in 2006. We are in the “but now, no more” phase even at places just minutes from “protected” world class sites like Sipadan. On Mabul, next to resorts full of divers, there were several shops absolutely full of beautiful shells that had been harvested from local waters. Shells that any diver would have loved to have seen in the water. While in the water, I saw ONE large shell that was still alive in the 20+ dives I did. Yet another example where a sustainable balance has to be found and that is if it is not already too late. Trash in the water around several of the islands was very discouraging. 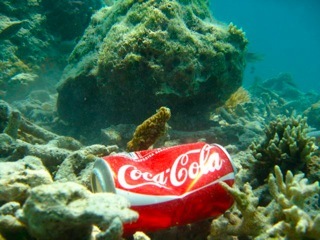 Aside from the obvious dangers from plastic especially for the turtles in the area, the trash was so common in some places that it made the dive unpleasant. Some of the dive operators in the area are trying to improve the situation but it seems like a very tough fight. 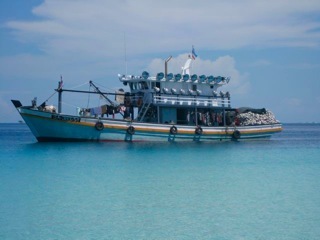 While we were on a surface interval at Sibuan, I saw the fishing boat pictured here, anchored on the reef in an area where it was not supposed to be in the first place. The guide said it was simply due to lack of enforcement. 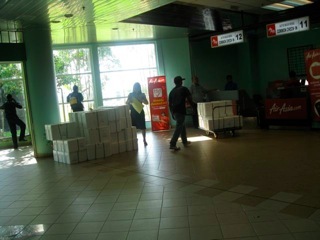 When I got to the airport I waited in the queue watching box after box of fish being x-rayed and checked into cargo presumably headed back to KL on my flight. Once again, is this a sustainable balance? It sure did not feel that way on many of the sites I dived. The most shocking thing that happened while I was diving near Sipadan was twice I was startled underwater by powerful explosions from dynamite fishing. This is illegal in Malaysia but was supposedly happening on nearby islands that were either in the Philippines or just simply not patrolled. Dynamite fishing not only destroys a lot more fish than it allows the fisherman to harvest, it obviously destroys the habitat. The absolute epitome of unsustainable. I started this with a quote from Cousteau mentioning an “untouched piece of art” and told you about some wonderful things I saw but I’ll leave you with the quote from Bill Hicks that kept going through my head as I tried to lower my heart rate after the explosions. The oceans are not an inexhaustible resource. The “…but now, no more” reality of what we are dealing with is here right now and I have seen it firsthand in one of the most beautiful undersea places on this planet. Please take an active role, even if it is just in making informed choices about the seafood you eat. 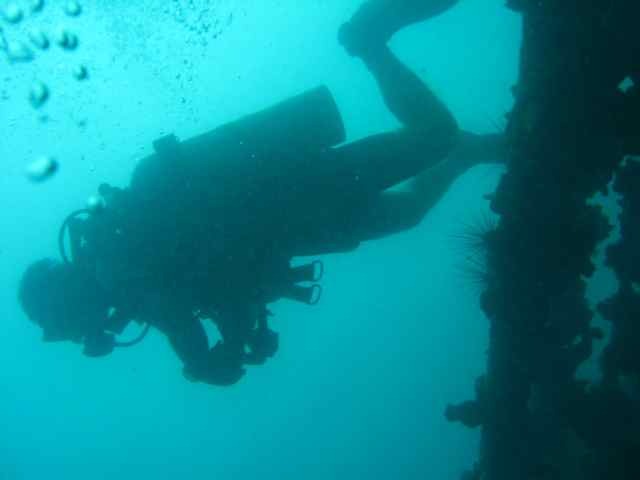 You can find the Diving Sipadan album on Picasa. There is also a Sipadan Highlights video on YouTube. Surimi (Imitation Crab Meat) (Pollock, another common fish used in Imitation Crab Meat is ~not~ shark). To see a full list, including Spanish, Greek, French, Italian and German names, please see the excellent page at VisionDive. Where does all the shark meat come from? There are some places where the outright 'finning' of a shark where the fins are removed and the carcass is discarded (because it is much less valuable that the fins) is supposedly not allowed. This is where you get the horrific images of a shark unable to swim, sinking to the bottom of the ocean to die, sometimes days later. And, is it really a good idea to be eating shark meat with mercury? The result of this requirement to land the whole fish means that there is shark meat, a meat that several government agencies suggest be eaten with extreme caution because of high mercury levels, that needs to be used somewhere. Both the Food Standards Agency in the UK and the US FDA have issued these warnings, especially for pregnant women. Even if this path towards extinction does not bother you, under the best of circumstances you should not eat shark more than about once a week (and never if you are potentially pregnant) because of the mercury. So now you say, "Ahhh, but I would never order shark so I have a clean conscience and a clean bill of health." Not so fast. Do you like sushi? Have you had a simple California Roll? You might have been eating shark in the form of the Imitation Crab Meat. Many sellers of shark meat attempt to hide the fact that they are using shark by using the names mentioned above. Please be aware of what these companies are feeding you and keep in mind the ridiculous, wasteful, and cruel soup that is the reason that much of the meat is available in the first place before you make your next visit to your local fish restaurant. And, please tell them why you are not spending money there! ‘Fin’ is a great introduction to the deplorable shark fin trade. Be prepared for some very disturbing images. Please share with your friends (and especially share it with any Chinese friends about to be married). Fin from alexhofford on Vimeo. Here are a few things from diving in and around Sipadan where a photo just was not enough. If you are reading this on facebook, the video is not imported. You can see it on YouTube. I’ve just seen another fantastic documentary based on a book by Charles Clover in the same vein as Rob Stewart’s Sharkwater called “End of the Line”. It uses easy to grasp logic, data, and real world examples to deliver a very hard-hitting message. That message is simply that we all need to start paying more attention to the oceans and the fish in them -right now- because the situation is dire. The fact that I watched this film while diving in Borneo made it even more poignant. I’ve been hearing the dive guides say things like “There ~used~ to be sharks here…” and “We ~used~ to see a lot more fish than this”. These are not people talking about “the good ol’ days” these are guides talking about what they saw just 2-3 years ago. This situation is rapidly going out of control and is arguably one of the most important issues facing ALL of us today. 1. Ask Before You Buy – Only eat sustainable seafood. There are tips and guides to help you do this on their website. 2. Tell Politicians – Respect the science and cut the fishing fleet. The film shows that there is simply too much fishing capacity in the world. We have to stop harvesting and sow for a while basically. 3. Join The Campaign – For marine protected areas and responsible fishing. In 2008 a very lovely Irish girl in Thailand showed me some amazing photos from the Perhentian Islands in Malaysia. Ever since then it has been on my to-do list for diving. Earlier this month I made it there. The Perhentians are made up of two islands called Perhentian Besar and Perhentian Kecil which are literally Perhentian “Big” and Perhentian “Small”. You are going to read lots of stuff on the internet that tells you Besar is quieter and more expensive and Kecil is more lively and cheaper. This seemed to be roughly true to me but there were exceptions with a couple of resorts on Kecil in the ‘premium’ category as well as places on Paradise Beach on Besar (where I stayed) that were in the ‘Budget’ category. And, as far as ‘lively’ goes, yeah, the interwebs are correct. Besar is definitely very quiet and Long Beach on Kecil has a few nightspots with music. I traveled by way of Kuala Lumpur. There are several options to get to the Perhentians from KL including bus, train, and plane. 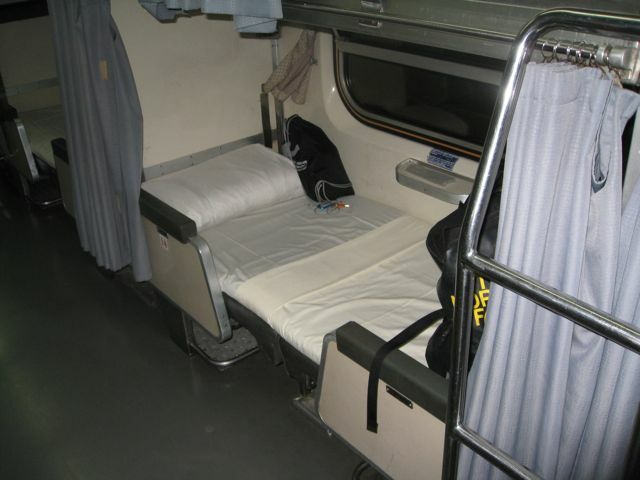 I chose overnight train and you can see a photo of the second-class berth that I had in the album. It cost just over RM50 ($18) for the 12 hour journey. I enjoyed the trip and it was a comfortable night’s sleep. You can get first-class berths that have beds for just 2 people (instead of the second class car that is full of bunk beds) for about RM110 per person. Those were sold out the day I traveled though. Try to use the ktmb website to book early and get a bed in the middle of the car away from the doors. I took the train to Tanah Merah and then got a taxi to the ferry port at Kuala Besut (about RM60) for the 45 minute ferry ride to the Perhentians (RM70 return). The most popular option seems to be an overnight bus. The prices are roughly similar to the train but the main benefit is that many of the buses take you all the way to Kuala Besut saving you the trouble and expense of a taxi journey. The other option is to fly to Kota Bharu and Air Asia will likely be the best option and not too much more expensive than the train. The place I stayed actually has a great FAQ that was really helpful for planning my travel. I stayed at Watercolours Resort on Paradise Beach on Perhentian Besar. I stayed in a few different rooms there which were the basic ‘Garden View Fan Rooms’. The rooms were clean and comfortable (for being on a small island with generator power etc.) and wifi was free in the restaurant!! I can happily recommend staying there. Do yourself a favor and take Rasman, the manager, some comic books and you might get a better deal on your room. Along with the free wifi in the restaurant the food is really good too. The Indian Noodles with vegetables for RM7($2.50) make a nice light but filling lunch between dives. There are a few other places on Paradise Beach on Besar including Mama’s Place where I stayed for one night when Watercolours was fully booked. They all seemed pretty good but the wifi at Watercolours is what sold me and the friendly staff and nice menu at the restaurant is what kept me there. 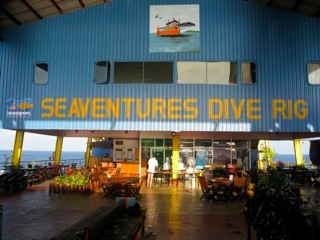 There is a dive shop at the Watercolours Resort which was a real pleasure to dive with. They have a professional and fun staff. In fact, several of the “Simple Suggestions for Dive Operation Managers” came directly from things that I liked at Watercolours. My logbook highlights from about 20 dives in the Perhentians are topped by the Coral Cat Shark. 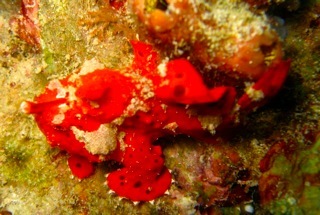 Unfortunately, I saw them on a night dive and do not have a photo of my own. There is a decent shot at Wikipedia. They are an absolutely beautiful fish and any time I get to see a new species of shark, I’m thrilled. 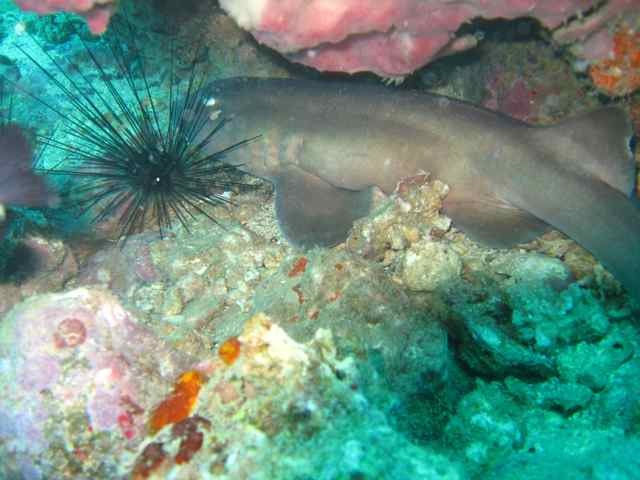 I also saw Grey Bamboo Sharks as well as the Brown Banded version along with Black Tip Reef sharks on multiple dives. 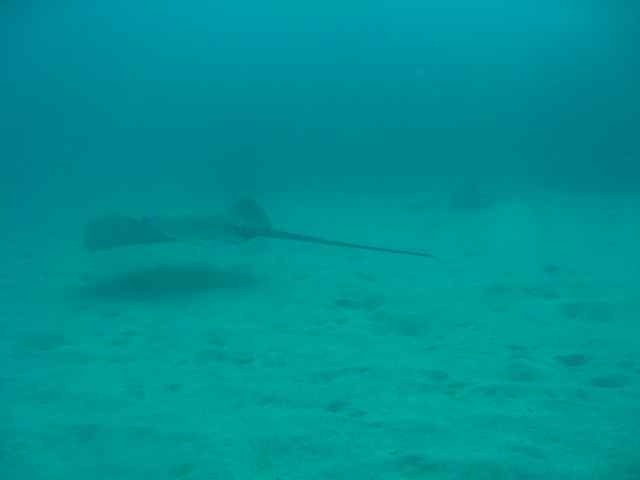 In the non-shark category, we saw a Jenkin’s Whipray that was a real treat. Another favorite was the Spiny Devil Fish which has a brilliant fin display. 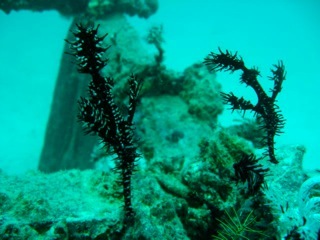 The coral seemed to be extremely healthy and was especially beautiful at a few sites. Seabell – When I was in the Perhentians the tidal gods were smiling on me and made Seabell easily my favorite site. The dive staff told me that it can quite often have bad visibility because of current but I was lucky and only saw the fantastic coral and fish thriving in all of that current. Terumba Tiga – I only got to dive this site one time and conditions were not the greatest but I definitely got a glimpse of its potential. I described it to my friend Drew (that I was extremely happy to finally get to dive with in the Perhentians) as the ‘Hand of God Dive’ because the site is made up of massive boulders and rock formations that seem like they were piled there by a higher power (that liked scuba divers). Swimthrough city. Tokong Laut – Temple of the Sea – This is a pinnacle that is great for Bamboo Sharks and just a pleasurable dive in general. Lighthouse – Two dives in one. 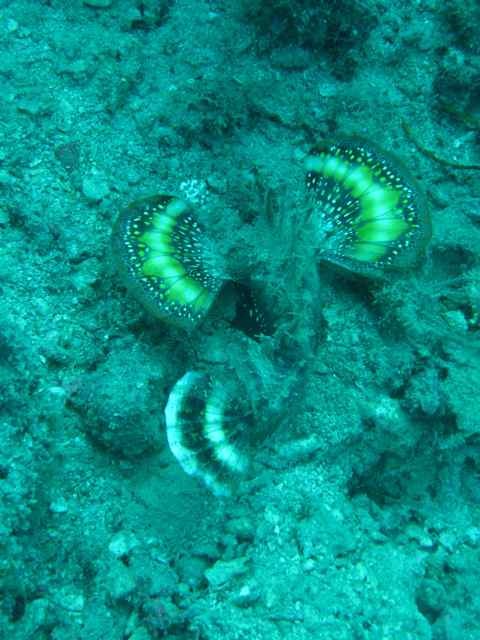 First, you drop down and get to look for Pipe Fish, Nudis, etc. and then you move shallower to some very nice coral. 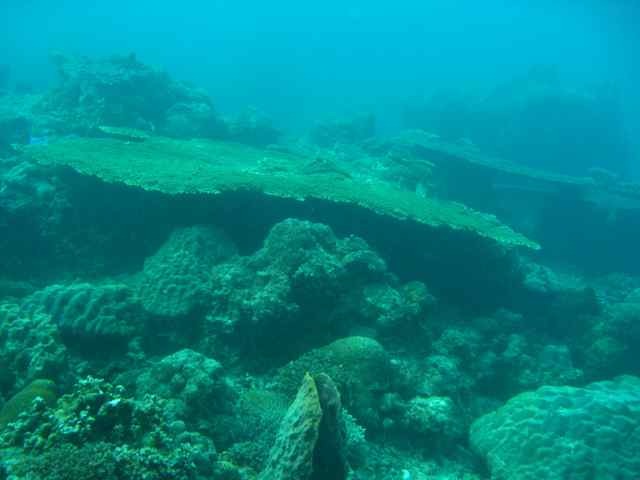 Sugar Wreck – The most popular wreck in the area (Vietnamese Wreck is also worth seeing though). It’s a wreck and the fish are 30% larger than you see at the other sites. I've checked the Perhentian Islands off of my todo list but I hope I make it back there one day. Many thanks to the staff at Watercolours for an enjoyable stay and fun diving. 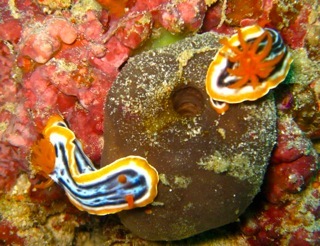 There is a photo album of several more photos from the Perhentians on Picasa called Diving The Perhentians. The dive industry has to be at the forefront of the fight to protect out oceans. Every single dive operation and the standards bodies should do everything possible to help their customers become educated about the wildlife they are seeing (or more likely not seeing). The divers can then be ambassadors to their family and friends to help spread the word that we all need to act now to be better stewards of the seas. Dive operators can do this through education about their local environments and being active players in reef check and cleanups. I have chosen dive operators before based on seeing news headlines or press releases about participation in these types of events. I am not alone in this behavior. Dive operators can also encourage global awareness by promoting screenings & discussions of documentaries and books like Sharkwater, End of the Line, The Cove, and more. (And yes, you are giving customers a great reason to come into the shop and look at that great new BCD too). This one should be obvious but it is amazing how often it is not. Rental gear should not be scary to encourage customers to buy their own equipment. This also extends to your boats and general facilities. If my gas has a hint of a funny taste because of an old filter or I listen to bubbles throughout my dive for lack of a fresh o-ring the chances of me coming back drop dramatically. When in front of customers, whether it is before, during, or after diving, you are always “on”. In my opinion professionalism leads to fun because customers feel safe and comfortable in the company of a competent guide and it makes it much easier to relax and just have fun. The dive operation should have a focus on customer service and embed this into the culture. In many dive operations, customers can be made to feel like simply a means to fund the lifestyle choices of the staff rather than the primary focus of service. If you have dedicated compressor or equipment room staff, put them in the water and show them exactly how important the difference is between excellent and poorly maintained equipment. Dive staff are just like any other people in the world in that they want to do a great job. However, many are not given a “system” in which to perform. Staff that dive the same sites and see the same things day after day suffer mightily from the ‘Curse of Knowledge’. They gloss over briefings and the results are at best a less valuable experience for the customer and at worst, dangerous. The ironic thing is that instructors are all to happy to give a ‘hand waving’ briefing that they would fail a divemaster candidate for giving. What exactly is the point of that training if we are not going to use it? Do your briefings from briefing boards with bullet points. Cover navigation, wildlife, hand signals, separation, tides and current, hazards, and the rest the same way before each dive. Of course, on repetitive dives this process can be abbreviated but having it on a board makes this very easy to do. Debriefings should be viewed as one of the most important parts of the dive and should be consistent, required, and planned. I believe that debriefings that include highlights (and lowlights) of dive, wildlife id, and general discussion can be the absolute best opportunities for brief ‘continuing education’ points as well as fostering a real love for diving. What a great time for your guides to say “we have seen this today but at divesite X, which we might be able to do tomorrow, we have seen a rare version… etc.” From a business standpoint, the fact that this chance is often squandered baffles me. Nothing good can come from a large group of divers in the water. Keep your groups small and separated if possible. Furthermore, cater to special requests if logistically possible. If you post rates for a ‘private guide’ and/or ‘private boat’ so it is easy to understand what is possible for the customer, you might be surprised how many people are willing to pay for ‘premium’ service. Divers with differing abilities, different objectives (nudibranch photographing vs shark watching), or just in search of comfort can be a great source of revenue for you as well as greatly enhancing the customer’s experience. Smoking should be allowed in the water (on long trips if necessary) or on the top deck of a dive boat. There should never be any smoking on the dive deck. That’s about all I have to say about that for now. Hopefully, I’ll be able to add to and refine this list over time. What a fantastic idea for SharkSavers.org / WildAid to use Yao Ming in an ad campaign against shark fin soup in China. Here’s a link to the english version of the ad. Cantonese and Mandarin versions are airing in China along with a billboard campaign. If you see a restaurant that is serving shark products, leave and please be sure to tell them exactly why you are leaving. Better yet, ask them about booking a banquet for a few hundred people and then when you see shark fin on the menu make that loud sucking sound and explain that you’ll have to take your business elsewhere. We’ve teamed up with the fantastic folks at RedBubble to offer some designs that they will happily put on a (very nice) t-shirt for you. 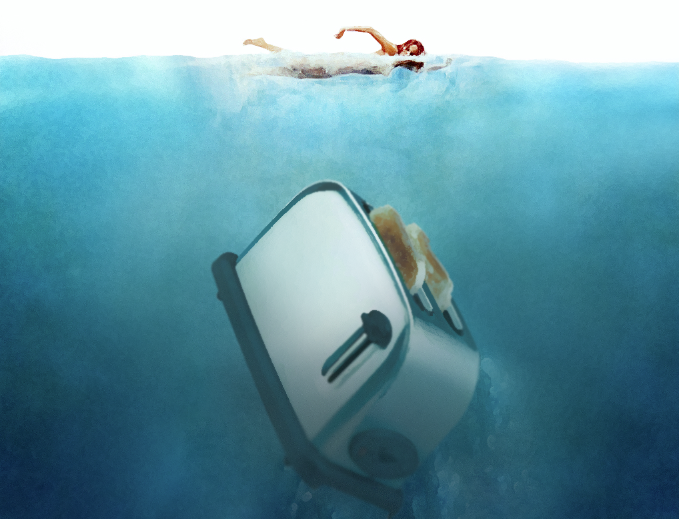 My favorite one right now uses the popular meme of toasters killing A LOT more people than sharks (see the Stuff That Can Kill You post). There are some other designs available there, including a very nice Weedy Sea Dragon graphic that you can see on the Merchandise page too.